I usually don't like taking down the Christmas tree. It seems a shame to remove such a beautiful thing from our house. 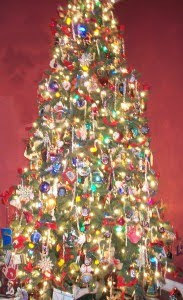 But this year we had a "mission" while stripping the ornaments. . .we were going to count how many were on the tree. A friend had asked me before Christmas how many ornaments were on the tree, and I didn't have any idea. At one time (when life seemed to provide more time), I had all my ornaments cataloged as to where they came from. I'm afraid even if I could find that list now, it would be woefully out of date. So my daughter and I set about to remove the ornaments and set them in piles according to their type, so that we could count them. In the end, we had 736 ornaments on our tree. 146 of those are "memento" type ornaments. If you read the post about my trip to Savannah as an eighteen-year-old young woman, Santas, concert tickets and the lady in Savannah..., you know why our tree has 27 tickets on it, or seven handprints made by children now grown and grandchildren yet to finish growing. It has mementos from vacations, trips, birthdays (several important birthday candles grace the tree, 16, 18, 40, 50). Miniature copies of wedding invitations and graduation announcements dangle from the branches along with footprint buttons celebrating the births of several babies. Decorating and un-decorating the tree is an opportunity in reliving all those events. Finally though, the tree was empty except for who knows how many lights. As I sat looking at the bare tree, I thought about how it now looked like any other Christmas tree. It was simple, plain and pared down to the essence. It had been stripped of everything that made it unique and different. Then the thought hit me, as bright in my heart as the light from those tree lights, one day we will all stand, stripped of all we think makes us unique, different and special. Everything we use to adorn ourselves will be taken off and we will stand alone before our Creator to give account. Male and female, rich and poor, educated and illiterate, powerful and powerless, smart and simple. . .all will give an account, and the question will be "What have you done with my Son, The Lord Jesus Christ?" For those who have rejected the Lord Jesus throughout their lifetime, they will face a Righteous judge who will look to see if they have ever placed their faith in His Son who sacrificed all for their salvation. The Scriptures tell us that "whosoever is not found written in the book of life will be cast into the lake of fire." Thankfully, if we have entered into a personal relationship with the Lord Jesus, we will stand before a kind Father whose heart "delighteth in mercy". The blood of Christ will shine over us and He will see us through that Sacrifice that was perfectly made once and forever, accepted in our stead for eternity. Next to us will be the pile of actions and deeds we have amassed throughout our lifetime. Oh, what a towering pile it will be, for we like to be busy! The good, the bad and the ugly, all piled together waiting to make a huge bonfire. In an instant, the fire of judgment will burn away everything that was not done with a pure heart, a true motive. Those things done after the flesh will spark and burn as wood, hay and stubble. Only those true things will remain as gold, silver and precious stones. I often wonder how tiny will be my little pile! Even as we shed tears at the loss, at what we might have presented to the Lord through our actions and deeds, the Scriptures tell us that "every man will have praise of God" and that "God shall wipe away all tears from their eyes". What a comfort! So as we travel our days affixing to ourselves those ornaments to cover our bare branches and to make us feel as if we are special from our fellow man, let us remember, the day comes when we stand bare before the True and Living God. Only one life, ’twill soon be past,Only what’s done for Christ will last. Only one life,’twill soon be past,Only what’s done for Christ will last. Only one life, “twill soon be past,Only what’s done for Christ will last. Only one life,’twill soon be past, Only what’s done for Christ will last. "